Instant downloads of all 942 LitChart PDFs (including Tess of the d'Urbervilles). Angel is the youngest son of Reverend Clare, and the only one without a University degree, despite being the brightest. One day his father found that Angel was reading philosophy books, which made the Reverend indignant. Then Angel declared that he did not intend to become a parson. He had great affection for the Church, but could not make himself believe, and so could not properly take the oaths. Angel is revealed as a man trying to be independent from his family and society, and this manifests itself in rejecting his father's religion. His disbelief in Christianity is entirely intellectual, and he lacks Tess's instinctual nature. Reverend Clare was shocked and grieved at this news, and finally decided that if Angel was not going to serve God he had no need of a Cambridge education. Angel accepted this, and then began a long period of trying out different studies and occupations. He went to London and had a short affair with an older woman, but escaped and ultimately decided his temperament favored the rural life and intellectual freedom. He chose to become a farmer in America, the colonies, or England, and he began his apprenticeship of agriculture's many branches, and so ended up living and working at Talbothays. Reverend Clare cannot even conceive of his son disbelieving, so deep is his own faith. Hardy portrays his sincere convictions positively, in a similar way to Tess's instincts. Angel's path from the city and the intellect to the country and farming predicts his relationship with Tess, although he is not yet at home in the agricultural world, and still an outsider among the rural folk. Angel stays in the largest room in the attic, and at first he liked to read and strum his harp in the evenings, but soon came to enjoy eating with the rest of the workers downstairs. His preconceived image of the farm-worker, characterized by newspapers as “Hodge,” was destroyed by the unique realities of each person, who were as varied in intelligence, experience, and personality as any group. Angel's tendency to idealize and stereotype foreshadows the appearance of his later faults. He is able to accept the farm workers as unique individuals after a while, however. This relates to Hardy's emphasis on regarding Tess as a person rather than just a symbol or ideal. Clare then begins to enjoy his outdoors work more, and feels more liberated in Nature than among books. He starts to grow familiar with the seasons, the weather, and the landscape. Angel finds some of the life and freedom in Nature that Hardy has been celebrating through Tess's character. Angel usually sits apart from the mess table, and the churn turns on the other side, pulled by a horse. For a few days Angel has been occupied with reading, so he hasn't noticed Tess's appearance yet. Then one day he is imagining a piece of music and notices a new, flute-like voice from the table. Tess is talking about how she can look at the stars and feel her soul leaving her body. When the attention turns to her she blushes and diverts it. It is notable that Tess remembers their brief meeting but Angel does not, and also that his intellectual pursuits distract him from first noticing her. Tess unwillingly reveals some of her complex religious depth and her troubled soul, which seems out of place among the other table conversation. Angel keeps watching Tess, and remarks to himself what an innocent “daughter of Nature” she seems. Then she suddenly feels familiar to him, and he thinks he has seen her before. Angel does not give it much thought, but it is enough to make him keep noticing Tess among the other women. Here Angel begins his idealization of Tess as a pure, mythical Nature symbol. He knows he has met her before, but cannot remember the details like Tess can, which foreshadows how his soon-forgotten whims will affect her. Cosby, Matt. "Tess of the d'Urbervilles Chapter 18." LitCharts. LitCharts LLC, 3 Nov 2013. Web. 21 Apr 2019. Cosby, Matt. "Tess of the d'Urbervilles Chapter 18." LitCharts LLC, November 3, 2013. 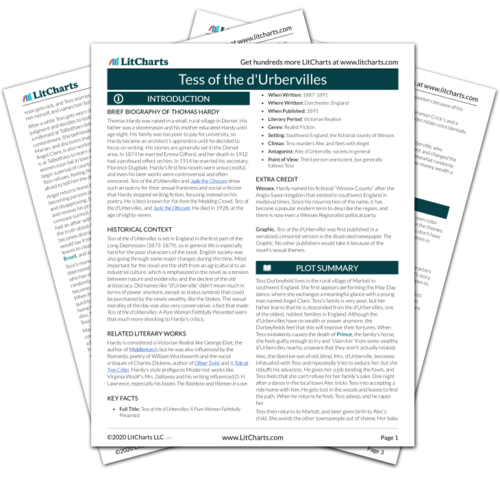 Retrieved April 21, 2019. https://www.litcharts.com/lit/tess-of-the-d-urbervilles/chapter-18.